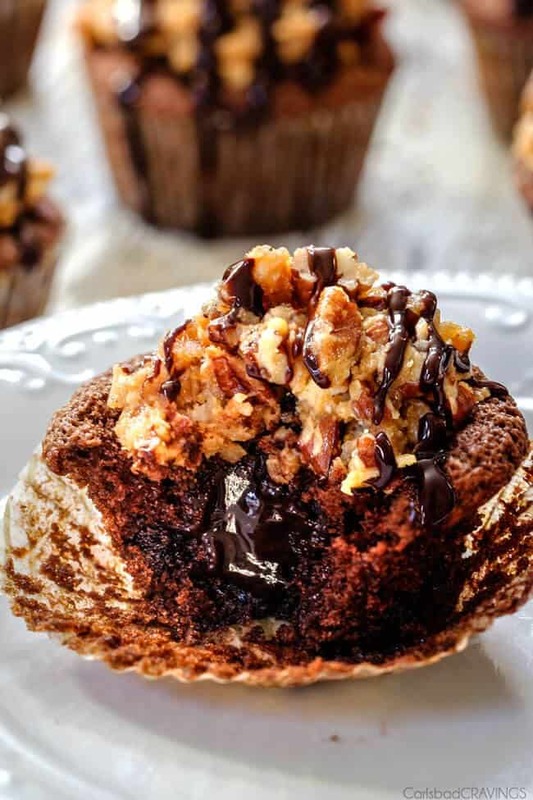 Super moist, rich, chocolaty German Chocolate Cupcakes brimming with Chocolate Ganache all topped with caramel-esque sweet and crunchy Toasted Coconut Pecan Frosting! AKA meet your new obsession. 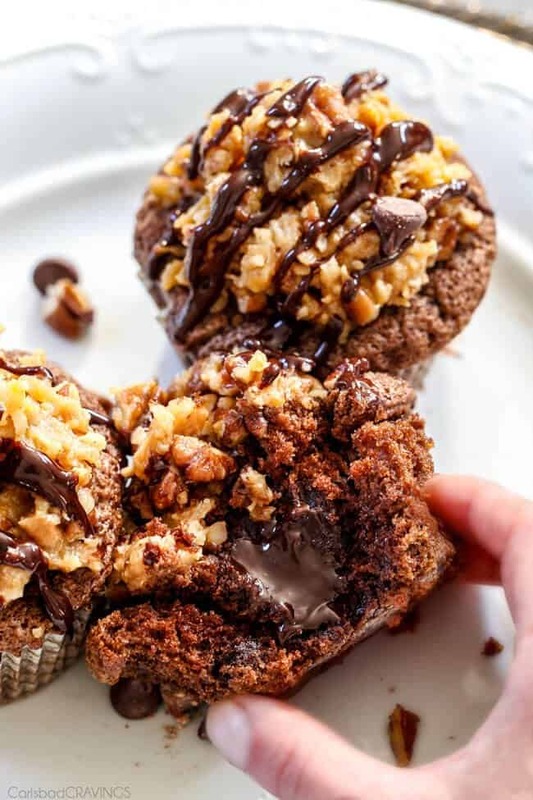 I am so in love with these German Chocolate Cupcakes with Chocolate Ganache Filling that I moved them up in my editorial calendar so you can all bask in their chocolate divinity ASAP! 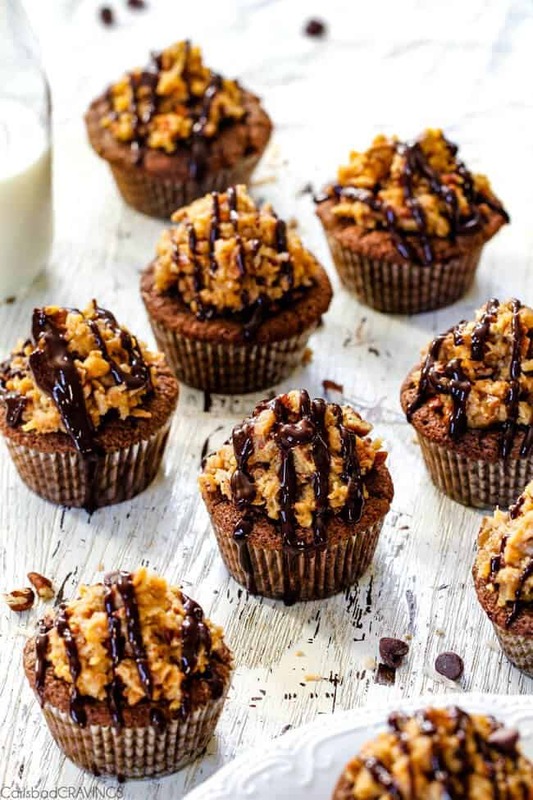 Every since I posted my German Chocolate Cake Cupcakes way back when, I have been wanting to do another spin on them because everyone should make them, eat them, love them and dream about them. And these German Chocolate Cupcakes WITH Chocolate Ganache are even better. First of all, you might be surprised to learn that the chocolate coconut delicacy we all love as German Chocolate Cake has nothing to do with chocolate from Germany but rather is named after Samuel German, a Walter Baker & Company employee (in Dorchester, Massachusetts), who developed the dark baking chocolate used for this dessert in 1852. 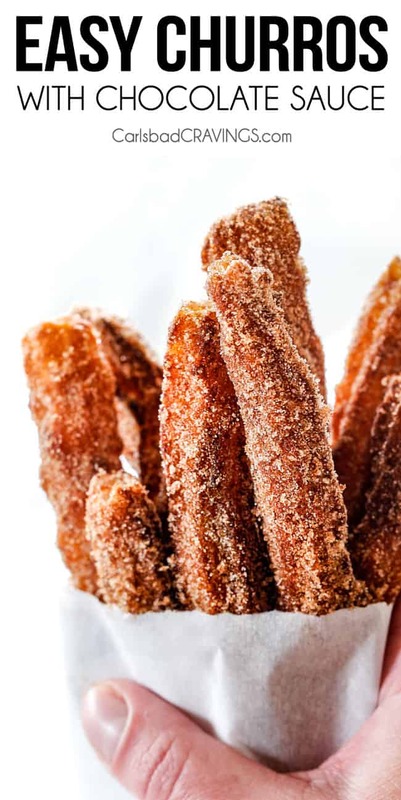 Before German’s creation, Baker only offered an unsweetened chocolate bar, whereas, German’s creation contained a large amount of sugar, making it even sweeter than our modern day semi-sweet chocolate. Over a century after German’s creation of German Chocolate, German Chocolate Cake itself became wildly popular in 1957 when a column of a Dallas newspaper featured, “German Sweet Chocolate Cake” which is almost identical to how we know it today. Within a few weeks, local grocery stores ran out of German chocolate. When Baker’s discovered “German Sweet Chocolate Cake” was the source of the run on their product, they began printing the cake recipe on all of their German Chocolate wrappers and today we not only have every version imaginable of German Chocolate Cake but German Chocolate Cheesecake, German Chocolate Cookies and of course, these German Chocolate Cupcakes! Thank you Samuel German. Because German chocolate is on the sweet side, I’ve paired it with semi-sweet chocolate, unsweetened cocoa powder and tangy buttermilk so we have a rich, multi-dimensional chocolate-buttermilk cake that is not overly sweet – but ready to cocoon our Chocolate Ganache. The Chocolate Ganache is s simple whisking of chopped semi-sweet chocolate and German chocolate into very hot heavy cream and butter to create a mega silky, molten chocolate surprise. How easy is that?! There also is no piping the chocolate into the cupcakes. Simply cut a cone-like shape out of the top of each cupcake, take a bite off the bottom of the cone (or cut it off if you prefer), fill your cupcake with chocolate and replace the top of the cone. This is the same method I used in my Ding Dong Cupcakes, so if you want to see step by step pics, you can see them HERE. Next, create your uber delectable sweet and sticky Coconut Pecan frosting by first toasting your coconut and pecans together in the oven. A lot of recipes don’t call for this, but this extra steps makes such a difference! Next, whisk together your brown sugar, evaporated milk, and butter and simmer until thick enough to coat the back of a spoon to create a gooey caramel like frosting base that you lace with your toasted pecans and toasted coconut. No words…. 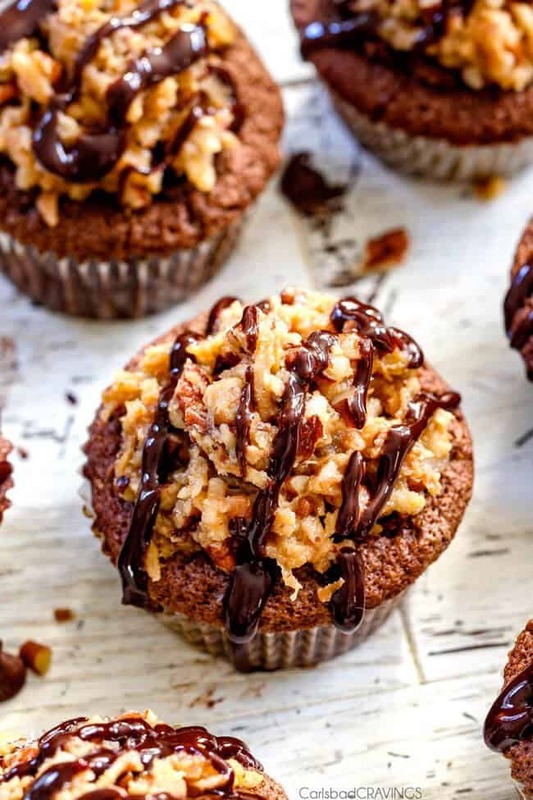 Want to try these German Chocolate Cupcakes with Ganache Filling? Pin it to your DESSERT, CUPCAKE or CHOCOLATE Board to SAVE for later! Ganache: Add heavy cream and butter to a large microwave safe bowl and heat for 1 1/2- 2 minutes (until simmering), stir to combine. 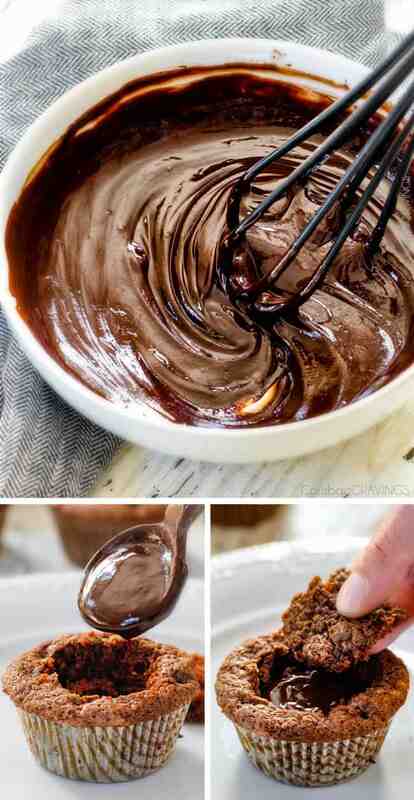 Add chopped chocolate and vigorously whisk until chocolate is melted. Place in the refrigerator to thicken and cool. Toast Coconut and Pecans (for frosting): Heat oven to 350 degrees F. Add coconut to one half of a baking sheet and pecans to the other half. Bake for 5-7 minutes, or until coconut is golden, stirring occasionally and watching closely towards the end as coconut turns very quickly. Once golden, remove to a large bowl/platter, or any cool surface. Cupcakes: Grease 17 cupcake liners in a cupcake/muffin pan. Set aside. Heat 1/4 cup water in a medium microwave safe bowl until simmering (about 1 minute on high). Add chopped German and semi-sweet chocolate; whisk until smooth. Set aside to cool. Sift flour, baking soda, baking powder, salt, and cocoa powder in a medium bowl. Set aside. 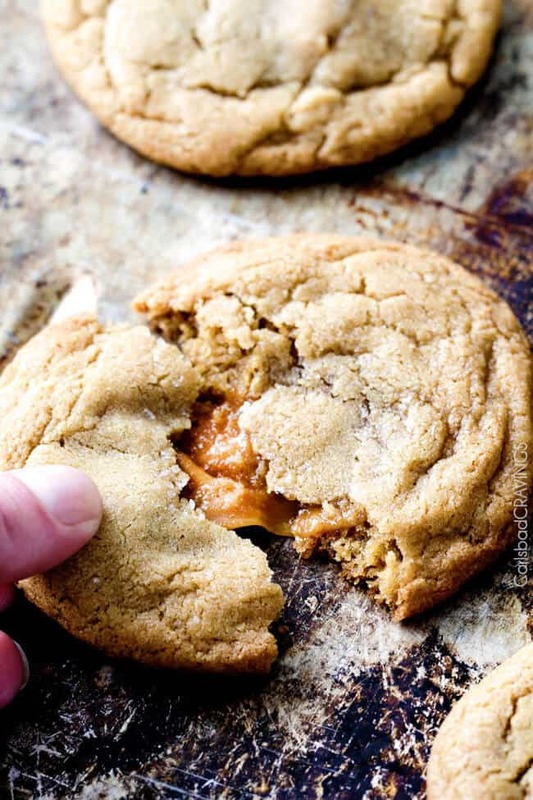 With a hand or electric mixer on medium-high speed, cream butter and sugar together until light and fluffy, approximately 3-4 minutes. Add eggs, 1 at a time, mixing just until incorporated after each egg. Beat in melted chocolate followed by vanilla. Turn mixer to low and slowly add the dry ingredients, alternating with the buttermilk. Fold in chocolate chips. Pour batter into greased cupcake liners. Bake at 350 degrees F for 15-20 minutes or until toothpick inserted into center comes out clean. Cool cupcakes in the pan on a wire rack. Assemble: Insert a knife at 45 degrees approximately 1/4 inch from the edge of each cupcake, and proceed to cut a cone shape. Remove cone and cut away all but the circular top (“Top”) – or just eat the bottom of the cone. (see How To Pics HERE). Fill each cupcake with a heaping 1/2 teaspoon Ganache and replace Top. * Scoop the frosting onto the cooled cupcakes with a heaping 1/2 ounce ice cream scoop. Chocolate Drizzle (optional): Add chocolate, heavy cream and vegetable oil to a medium microwave safe bowl. 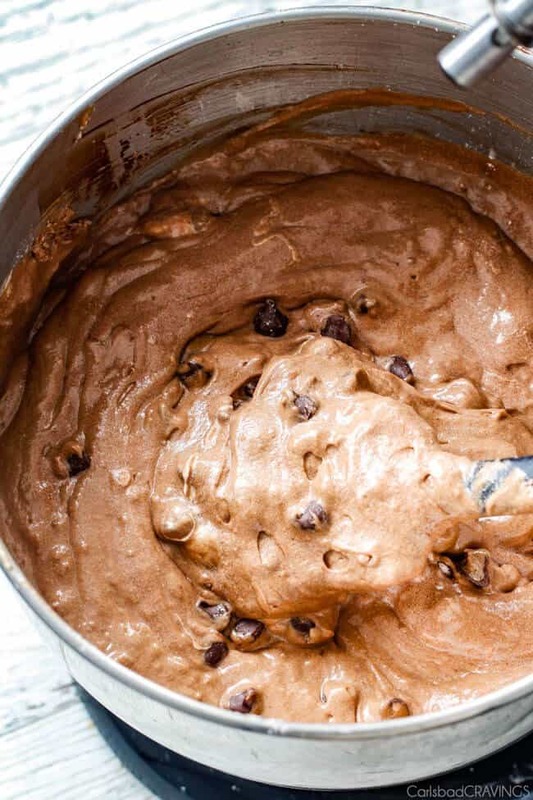 Melt chocolate in microwave, mixing at 30 second intervals until melted. Drizzle over cupcakes by placing chocolate in a Ziploc bag, and cutting off the corner. Store Cupcakes in an airtight container for up to 2 days then refrigerate. I like to warm my cupcakes for 10 seconds or so before eating- so good! *If Ganache has thickened too much, then microwave at 5-10 second intervals, stirring in between until Ganache reaches desired consistency. **Ganache will thicken as cupcakes sit at room temperature and is still delicious but for a "molten" oozing ganache as shown, microwave cupcakes for 5-10 seconds each before devouring. Hi Jen! OMG these look amazing! I love German chocolate cake and I especially love the frosting! Like you, I always toast coconut and pecans! I have a few favorite cakes (all homemade, dense and moist)…dark chocolate, fresh apple, sour cream poundcake and my carrot cake (which Nagi featured on her blog a while back). I do believe these cupcakes are going into my favorites category, after all cupcakes are mini cakes! Oh, I forgot a new favorite is Hummingbird cake which David at Spiced posted recently, it’s killer! Huh! Interesting. 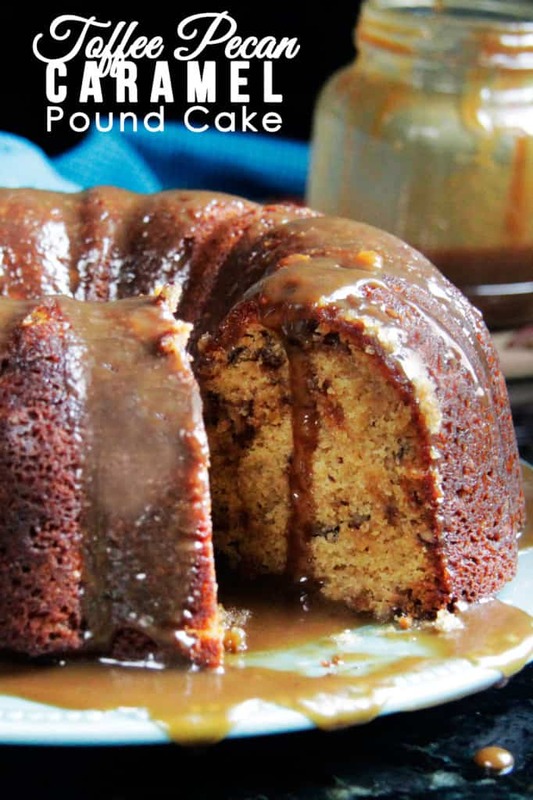 I had no idea that was the history behind German chocolate cake. And to think that all this happened a hop, skip and a jump away from where I live. I bet little ol’ Mr. German wasn’t even thinking about all the deliciousness that would come from his chocolate-y genius. 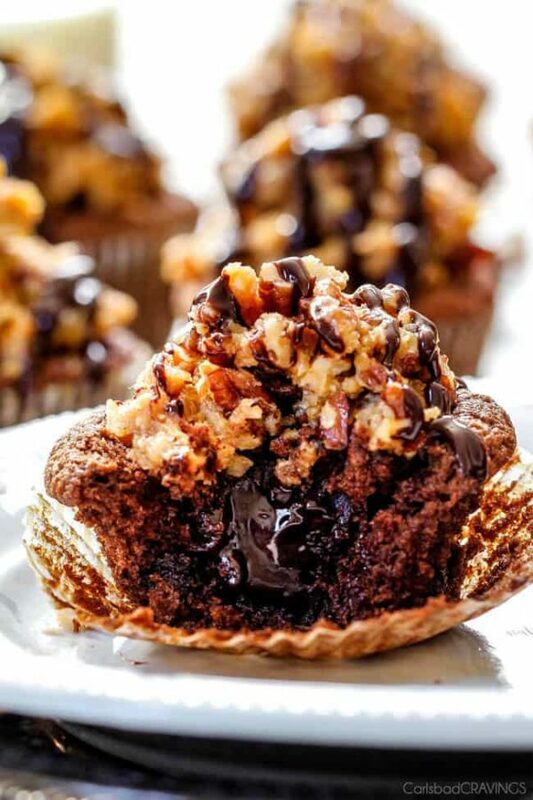 I mean. . .these German chocolate cupcakes are next level. Just look at all that oozy chocolate flowing from the center, teasing me like there is no tomorrow.. It’s taking all of my will power not to dive directly into the screen. Thanks LaTrice! I hope you can make them soon and love them! Can the batter be used to make a 9×13 cake? I looove these cupcakes but I’m needing a cake to send to my husbands work. Thanks.